Discussion in 'The Low Bands - 630/2200 Meters - VLF' started by K9STH, Nov 10, 2017. It will be much easier to start receiving on the new bands than it will be to actually put a signal on the air. There are a number of older, tube-type, receivers that work very well especially for the 630-meter band. The World War II surplus receivers like the Command Set BC-453 and the BC-348- series both go down to at least 200 kHz and up to at least 500 kHz and both receivers are reasonably sensitive. In addition, there are a number of solid-state amateur radio transceivers that have receivers that go below the AM broadcast band. In addition, there are a number of LF / VLF receiving converters that are available, in kit form, for $20.00 or less that can be used with "normal" HF amateur radio equipment. For the 2200-meter band, selective voltmeters are, basically, VLF receivers that work VERY well on those frequencies. Some of these voltmeters, my Rycom unit is an example, are actually SSB receivers as well as AM receivers. The Rycom covers from under 1 kHz all the way to 220 kHz and has a digital frequency readout. Here are photographs of my receiving equipment for the new bands. The converter is paired with my Heath SB-301 receiver using the 15.0 MHz "WWV band" and covers both the new bands plus all frequencies from under 1 kHz all the way to 500 kHz. I did not include a photograph of my Kenwood TS-440SAT because most amateur radio operators are familiar with the unit. What equipment are you planing on using or, are using right now? I plan to use a coherer. Way back I was lucky enuff to get a command set that covered the AM broadcast band. I own a WWII navy National RBL-2 Regen receiver that covers 16 khz to 600 khz. An 80 lb. Beast. Bummer! We threw out our Rycom 6030 units years ago when we pulled out the analog microwave. Actually, I think they went elsewhere in the company. I am listening on my TS-590S, and thinking of getting an MF S0lutions downconverter for transmit. Still thinking about how to amplify the 20 watts output to reasonable levels, but it will be easier than amplifying the milliwatt 630m transverter output signal of the TS-590S. For the 2200-meter band, selective voltmeters are, basically, VLF receivers that work VERY well on those frequencies. Some of these voltmeters, my Raycom unit is an example, are actually SSB receivers as well as AM receivers. The Raycom covers from under 1 kHz all the way to 220 kHz and has a digital frequency readout. When I first started kapiddling with VLF back in the Pleistocene era, there was a direct conversion receiver that used a 555 IC for the local oscillator....yes....square wave driven mixer....and it worked AMAZINGLY well. I'll think I'll build another one just to wobble the nostalgia follicles. Also, I'm working on an article for QST on the Lock-In Amplifier. 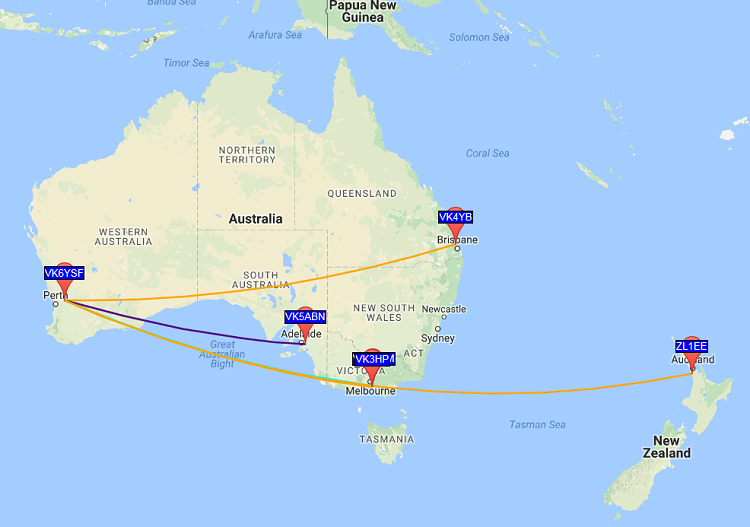 I'm currently receiving with my old TS-930 radio for both 630m and 2200m and have had better than expected success using an active antenna with WSPR. I've used several over the years, none particularly stellar. Old mil radios were pretty thin on the ground where I was! I used a Drake SSR-1 that at least pulled in a signal once in a while. Later I used a Sangean radio intended for shortwave but it goes down to 150 kHz. When Palomar Engineers was still making radio stuff I bought one of their VLF converters but found it deafer than the Sangean. I have an early Ten-Tec SDR that was about as good as the Drake but didn't need to warm up for stability. Lately I've been using my IC-7200. I've always liked Icom's receivers and this one seems to work pretty well, which is better than any other one I've used. I have a BC-453 that I'll use for 630 meters. I already use it for listening to NDB beacons. Its a little beat-up but it works.